Compos are the competitions on SketchClub. They are a great way to get your sketches seen by a lot of people and start building a fan base in the community. Each compo also has fabulous prizes you can win! The act of creation itself is the greatest reward of course, but a nice gift is always a great bonus. New creations only. The compos help encourage and motivate you to create new things. You cannot simply enter an older sketch of yours. Original content. Your compo entry should be an original creation. References are okay but you must mix multiple references to create something new. Close reproductions are not allowed unless it is own your own personal photo. 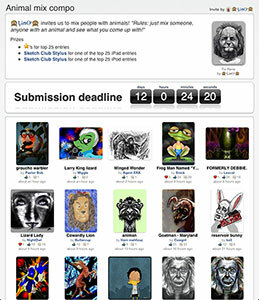 Once you've finished your entry just upload it to SketchClub as usual and you'll land on the page for your sketch. Below your sketch you'll see the option to enter your sketch in the compos it qualifies for. After the submission deadline for a compo the voting process begins. A random ballot is generated for each voter which is broken into up to 25 sets of four sketches. For each set the voter compares the four sketches and determines which they believe should be the highest ranked among those four. When the data across all voters is combined this reaches a community consensus for the final ordering of the sketches and seeks to satisfy the Condorcet criterion. Do you have a fun or awesome idea for a future compo? You can create a compo invite which is a sketch providing an example or invitation for the compo. Include in the description an explanation of the theme and rules for the compo. Tap the "edit your sketch infos" button on your sketch page then enable the "Compo invite" option to mark your sketch as an invite. Each week one of the top rated compo invites is chosen to become the next compo and if yours is chosen you get some bonus glops! Sketches which do not meet the rules or follow in the spirit of the compo may be disqualified. You can report sketches for disqualification with the standard sketch reporting button on each sketch page. A special group of volunteers reviews the compo entries and reports and has the ability to disqualify entries that do not fit. If this happens to you, please carefully review the rules to see where you may have gone wrong. If you still believe your entry belongs in the compo please visit the Compo Review group and post a new thread in the group forum linking to your sketch and providing extra details so reviewers can re-check it. Please respect the reviewers decision and understand they are kindly volunteering their time to keep compos fair for everyone.